There is no shortage of news stories about different parts of the U.S. and Canada experiencing devastating losses due to various weather conditions. Now that summer is here, the weather becomes ripe for wildfires and forest fires. According to the NIFC (National Interagency Fire Center) on average, there are more than 106,000 wildfire forest fires each year in the U.S. An equally staggering number is there are as many as 20,000 RV fires reported each year. These numbers reflect how important fire safety and fire prevention are to the RV lifestyle. If you can’t put the fire out in the first 30 seconds, leave it to the fire department. All RVs and towed vehicles should be equipped with fire extinguishers. Most people don’t realize there are four classes of fire extinguishers: A, B, C, and D, and each one is for a specific type of fire. The NFPA (National Fire Prevention Association) requires that you keep one with a minimum rating of 5BC at each exit. For even more protection, go with the ABC type, which can be used to put out all different types of fires. Check your extinguishers regularly to make sure they are operational. (Just because the needle shows in the green dot does not necessarily mean it’s working.) 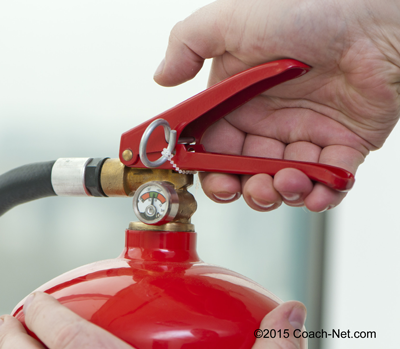 Make sure you and everyone else traveling in the RV knows how to operate fire extinguishers. You can print the helpful acronym “PASS” (listed below) and put next to your extinguishers as a reminder. Pull the pin at the top of the extinguisher to release a locking mechanism. Aim at the base of the fire, not the flames. Squeeze the lever slowly to release the agent in the extinguisher. Sweep from side to side, moving the fire extinguisher back and forth along the base until the fire is out. Smoke detectors are required. Get a UL217 to be in code with NFPA mandates. Check all hoses, wires and connections before every trip and during a monthly fire check. Eyeball your tires at each stop when you’re on a road trip. Make sure everyone knows what the smoke alarm sounds like and what to do when they hear it. Educate your passengers on using a fire extinguisher. Make sure your travelers know how to actually use the exits; not all doors open the same. Review “stop, drop and roll” technique with passengers. Use the designated fire ring or picnic grill. If there is no fire ring or grill available, clear a three-foot area around the fire down to the soil. Use only dead wood lying on the ground. Do not cut live trees or branches from trees near the campsite. Be careful with cigarettes. Dropped cigarettes, like matches, are major causes of fires. 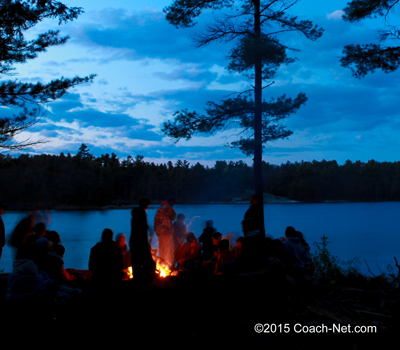 Douse the campfire with water and stir the ashes until they are cold to the touch. Remember, knowledge is power and prevention is your best friend. A minor fire may put a damper on your travel plans, but at worst; it can cost you a lot of money, damage, and possibly a life. Do your part to keep you, your passengers, and other RVers safe. WHY are RVIA/UL standards so weak regarding fire alarms? ONE smoke detector regardless of size! If RV alarms had to meet home requirements – less people would die in RV fires. How about each floor plan alarm gets approved by a certified fire alarm planner.